Now YOU enjoy karaoke at the comfort of your home WITHOUT paying sky high prices for karaoke songs! Hi, this is Rachel Patterson and I'm a karaoke nut! Ever since the first time I got up on stage , I remember it clearly as a teen, when I sang (my own female version of) Elvis Presley's "Can't Help Falling in Love", I've been one of those people who just l-o-v-e karaoke. There's nothing more I enjoy than getting up, in front of my friends, and belting out some of my favorite songs. But you know what? There's just this problem about karaoke that has always bugged me. It's just how darn expensive karaoke is! That fact is, I love to go out with my friends, especially on weekends, but I got really frustrated over time. When we go to this local bar, there's ALWAYS a bunch of guys who are all drunk and noisy, and I have to wait sooooo long before I get my turn to sing my favorite songs. And before you know it, you're not in the mood to sing anymore. So I wanted to find ways to do it in my own home. I imagined the fun we'd had… some homemade vodka tonics + your best friends + your fav songs? Pure blast, right? So I tried looking for karaoke machines, just like the one the local bar had. It was tough to find one, even online. And when I finally discovered a local seller, I almost fainted at its price tag. I don't even want to talk about it now. Gosh, it was even more expensive than going to the bar! So I decided to set up my own song library instead. It was my brightest of ideas… or so I thought. I started buying CD's after CD's and those CDG's, which were supposedly "better" because they had "better" G or graphics. At first I was very committed to slowly building my collection. "It's passion," I said. But then I discovered the frustrations of collecting karaoke CD's. The discs were so darn expensive! After a dozen or so, I had to stop buying new ones because they were simply costing me an arm and a leg. One CD would have around 15 songs and of those 15 tracks, there would only be 5 that I like. The rest are "fillers." "Forget this, I'm making my own!" 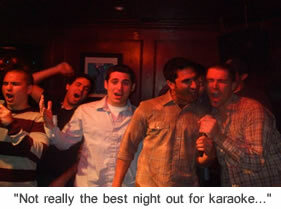 It would have to let users experience the best karaoke nights… each and every time! Because we don't want to wait for out turn just to get on the stage or deal with guys asking that we share their table when they've obviously had too much to drink. It would have to have hundreds of the best songs… because I don't want to run out of new tunes to belt out. You wouldn't to sing the same set of 12 songs each and every time you host a karaoke party right? It would have to be compatible with any DVD player… because I'm not a techie person and I know nothing about formats that need to be converted to a file just so I can pop it in my player. The last thing you need on a karaoke party is a "technical glitch." It would have to be easy to use… because I'm tired of having to eject and insert a new CD after 2 or 3 songs. Plus when you have a dozen or so discs, you have look at their labels when searching for a song. Get the CD containers all mixed up and there you have it… a tiresome and stressing way karaoke. It would have to be usable from home (or practically from anywhere)… so I won't have to drive back from the bar after a tiring night with friends. And sometimes, I'm feeling a bit shy to get on the stage, especially when there are other people around, so it should run in my own room. Finally, it would have to be affordable… because price is the root of it all. If we can sing in the shower for free, there's no reason why we have to pay hundreds (of sometimes even thousands) of dollars just to enjoy our favorite classics on karaoke, right? I admit I had doubts at first. But with a lot of determination and patience, everything just seemed to fall into place. Thankfully, the recording studios I approached were very patient as well. And after countless weeks of recording, rerecording, mastering, and gathering everything, it was born.
" Sing Karaoke Songs Just Like In The Pubs With Full Colour Lyrics! " Like Karaoke Pubs... Right In The Comfort Of Your Home! " Letters change colour in time with the music to show when they should be sung so it is easier to sing in time! Professionally studio recording, NOT cheesy midi or kara files. 4 DVD format with digitally enhanced audio quality so you'll enjoy superb vocal clarity when singing. "Rachel, what you have here is absolutely fabulous. Your DVDs contain top quality recordings at an unbeatable price! If you are love singing, you cant go wrong with the Karaoke SuperStar DVDs. At the price Rachel is offering this fantastic package, youd be crazy to pass it up. In fact, they have places they lock people like that up. :) Thanks Rachel for giving me the head thumping moment at 4 a.m. Enjoy the Most Unforgettable Karaoke Nights… Alone Or With Friends, at Home Or Anywhere, Without Going to Pricey Karaoke Bars or Settling for Lousy CDs! Choose from over 800 songs in 40 volumes… so you can stop wasting time & money on buying lousy CD's that contain too much "fillers" and too few of your favorite songs. Have your own neat & complete library of songs… so you can say goodbye to your "collection" of junk karaoke CDs. No more looking for missing discs! Stop collecting lousy CDs or going to annoying karaoke bars… so you can save hundreds or even thousands of dollars over time and spend the money for other things you love. Thinking of having fun at a party? Try playing the "kamikaze" mode with a random song selector! Did we mention it comes with an Interactive DVD Menu for easy song selection? This package includes 4 professionally recorded DVDs. Inside, you'll find over 800 Professional Karaoke Songs categorized into 40 Volumes. And because the DVDs are equipped with the Interactive DVD iMenu feature, you'll be able to navigate through the songs and categories easily and effortlessly… you can even use your DVD player's remote control! Think Duets, Chart Best Sellers, Oldies, Rock, Pop, you name it! From Madonna to Ashanti, to Sheryl Crow, to Britney Spears. From Led Zeppelin, to Elvis Presley (my fav! ), to Backstreet Boys, the list just goes on and on! 2. Choose Your Song & Start Singing! It covers all popular genres like : Pop hits, Rock Ballards, Golden Oldies, Duets, Chart Best Sellers, Country, Jazz and Blues to Country and Pop. 12. Avril Lavigne - Complicated. Karaoke Fun on 4 DVDs! If you're a karaoke fanatic or an entertainer looking for high quality karaoke productions used by professionals, then this would be the perfect product for you. Now picture this: In 15 days from now (or sooner) you'll receive the 800 karaoke songs that others would have paid over hundreds of dollars for. Imagine having 800 karaoke tracks in 4 DVDs which you can take anywhere you go. Now you can say goodbye to your karaoke CDG collection. And you can organize the karaoke party that you'd always dreamed of hosting. Even better, you know for a fact that you have the resources and you know exactly what to do with them to enjoy karaoke at a whole new level! ...and that's the truth!
" The Best Karaoke DVD I've Ever Bought On The Internet "
" Rachel, I can tell you that these DVDs are the best in its class, hands down! There is nothing to compare with the sheer quality and value these karaoke dvds offers. This is the best karaoke DVD I have ever purchased on the net. on a scale of 1 to 10, this is 12. The package is underpriced, so get it before Rachel realises it! get this right now ! " "I have to be honest with you, at first I was skeptical. But after recieving the discs in the mail and plugging it into my player, I quickly realised what I've been missing out. The level of quality and range of karaoke songs now shows me WHY this is the best compilation of karaoke songs in the market. There is only one problem with the DVDs. You have given so much of my favorite songs, that I just don't know where to start! If youre on the fence get this right now!
" If You Enjoy Karaoke, Don't Walk. Run & Pick This Up "
" There are a lot of good reasons to buy Rachels latest product (the picture of Rachel is definitely one of those reasons :> ). But the thing that really jumped out at me is the DVD menu selection for all the 800 karaoke songs. It makes song selection easy and hassle free. If you're planning on purchasing a karaoke disc... get this product. Don't walk...run and pick this up before Rachel comes to her senses and stops selling this. No ifs, no ands, no buts. Just get it.
" I'm Thoroughly Impressed. Highly Recommended ! " "This karaoke DVD discs are just remarkable. Highly Recommended!" It was a breeze to get started and it works right off my old dvd player. As a avid karaoke fan, I'm thoroughly impressed. If you enjoy karaoke singing, these DVDs are highly recommeded! My wife and I spend endless nights croning to all the oldies. Thanks once again Rachel. Are you a karaoke superstar? Listen to Marie's rendition of Natalie Imbruglia's "Torn". Great tone, great control. Great job Marie! 1. 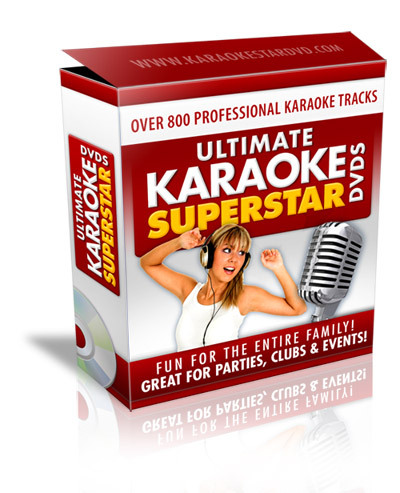 Most comprehensive collection of professional karaoke tracks on 4 DVDs. 2. Covers all genres from Pop hits, Rock Ballards, Golden Oldies, Duets, Chart Best Sellers, Country, Jazz and Blues to Country and Pop. 4. Original studio recordings with full karaoke video features. 5. 100% Digital Audio Quality and "LIVE" recordings with chorus back up vocals. 7. Comes with full color artwork and we'll provide you with printable songs lists too. 8. Whether you're just a bathroom singer or a karaoke enthusiast , these DVDs are perfect to train your vocals, tone and technique. Besides that, they are total great to sing along to and have fun! This is literally everything you need to get started singing right away, without feeling like you don't know what to do next. Your Entire Investment For Your Own Karaoke SuperStar Package Is Just A MEASLY $427.96 $197.00 $67! That's right, you'll pay so little for it that all it costs is $0.05 per song! That's an astonishing 5 cents per song! You really don't even have to think about it, though, because I'll guarantee you'll enjoy karaoke more with this...or you won't owe me a dime. You'll get the DVDs in your mailbox within 15 days and be on your way to obtaining the largest ever professional karaoke DVD compilation on 4 discs. Guaranteed. Here's How it Works: We're ready to prove everything we claim. Order the Karaoke SuperStar DVD Package right now, and see it for yourself within the next 8 WEEKS. If the product does not live up to any the claims stated here , I don't want your money, and I'll give back every penny back to you. No hassles and we can part as friends. 100% Money-Back Guaranteed. Simple. I know this material forward and backward. I enjoy using it everyday at home and in karaoke parties. Look, Ive put my heart and soul into this, and frankly, I wont feel this is a success unless you've enjoyed your karaoke singing more with this too. That's more than a guarantee. It's a promise. Like I said before, I'm going to remove this offer without warning as soon as I reach the number of licenses. I've got my eye on it like a hawk, and when we reach that point, I'll withdraw this offer immediately and not apologize for it. And I'm not going to keep the dinky introductory price I put on it. Not a chance. Once testimonials come rolling in, so I'm going to raise the price accordingly. First I'll bump it up to $97.00...then to $147.00 and more...and it'll still be a bargain for what you're getting. Yes! Just Let Me Have It Now! Save time. Save money. Enjoy value and convenience. If you desire great karaoke sound, enhanced video lyrics, and an enormous instant karaoke song library at your fingetips, then it doesn't get any better than this. Order it right now - And you'll never have to buy another karaoke disc again!
" That AFTER you get your Karaoke SuperStar DVD package and you see for yourself how much value you're getting on karaoke songs, then you can just look back at it all, smile that smile of satisfaction, and think to yourself: that was one of the best purchase you have ever made! " YES Rachel, I Want The Karaoke SuperStar 4 DVD Package Now! I also understand that it comes with an Interactive iDVD menu system so that I can choose my songs easily and effortlessly. I also understand that this package is not available anywhere else in the market. Plus there's absolutely zero-risk to me because this is backed by a full 8-week 100% money-back guarantee - if this product does not live up to the claims here, I'll get every penny back! P.P.S - Remember...you have my 100% Risk Free 8 Weeks Money-Back Guarantee - you can still keep any bonuses as my gift - if the product is not exactly as it is stated here and you are unsatisfied - I'll refund your money... and we can still be friends. Yes, I Want To Place My Order Now! Please note however that the online support ticket system offers you faster response time, thanks for your understanding. The product does NOT contain any original recordings and is not endorsed by the artiste or the recording company. Any names are used only for identification purposes. The content is custom recorded by Ant Studios and we own the master recording rights. Licensing and distribution authorized by Trill. Inc. Any unauthorised copying, distribution or reselling will be considered copyright. The DVDs do NOT contain any material from Zoom/Legends/Sunfly Karaoke.